Is a Cancer man being rather flirty with you but you aren’t sure if he’s actually interested in more? Maybe you’ve started dating a Cancer guy but not really sure if he really likes you or if he’s just playing along. Here’s how to tell if a Cancer man likes you. Cancer man is one that you should always pay attention to his actions because he only does things he means. If he really likes you, he’ll go out of his way to make you smile or laugh. He may randomly walk up to you and grab your hand while he’s talking. He’ll look you into the eye and perhaps tell you a very witty joke in order to make you crack up. He’ll find any excuse that he can to spend time with you or around you. He may also ask you lots of questions to get to know you. It lets him figure out what you like and can then use it to gift you later. If he’s already been trying to flirt, he may bring you a single flower, dessert to snack on, or offer to buy you lunch. This will especially be true if you work in the same place as the Cancer guy. A Cancer man that really likes someone will start to open up to that person. So if there is a Cancer man around you that has suddenly started to come to you with his problems or asking for your advice, he may have an ulterior motive. He may very well have a thing for you and this is yet another way he can be near your and spend time with you. He’s very shy so don’t be surprised that he’s trying to spend time with you in this type of way. It helps him get to know you and get closer to you without having to come right out and tell you he has a thing for you. If you like him, you may want to actually let him know though. The sooner he realizes that you DO like him, the more he’ll start focusing on actually having a relationship with him instead of trying to appear as a friend or co-worker that likes to talk. When the Cancer man hasn’t come out and professed his feelings yet, he will show you in other ways how he feels. I’ve mentioned him touching you while talking. He may also do things that show he’s becoming protective over you. Being protective is a feeling he has with someone he’s really into. This can include things like asking you to text him when you arrive home or at your destination. If you’re on a texting basis that will work in showing you he cares. If you aren’t even texting each other yet, he may offer to walk to you to your car wherever you are at. Perhaps he may offer to pick you up or drive you home depending on whatever is going on. He cares for your safety and he’ll do things that will ensure him you will be safe no matter what you’re doing. It’s also his way of showing you care. So if you’ve noticed that a Cancer man around you is becoming slightly protective, you know he probably actually likes you thus his care. 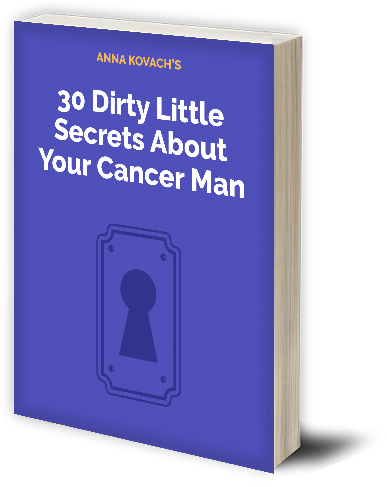 Cancer men can sometimes be overzealous or they can make promises that they don’t really intend to keep to some. However, when he’s really into someone, he will do what he says he will. If he tells you he will call you, he will. If he says he’ll meet you at a certain place at a certain time, you can expect him to be there. Any promises or plans he makes with a woman he really likes, he’ll keep them. He will make his life about the woman he covets. Everything he does becomes about how she feels, what she likes, and what he can do to please her or make her feel loved. Even such gestures at helping you carry in your groceries, move furniture or lift some heavy file boxes around the office. No matter what it is, he wants to make your life easier. Clearly, if he tries to touch you as much as possible, he’s showing you his desire for you. This can include touching your hand, your shoulders, your arms, or giving you a “look”. He may also show his body language when another man approaches you to talk to you. Even if it’s only about work, he’s going to have a look on his face like he’s not pleased about it. This shows his jealousy and once you see that, you are certain that this Cancer guy likes you. Cancer men are jealous and possessive. Seeing any man approach you even if it’s harmless is going to set him off enough for you to see it visibly. It’s not likely he’ll comment on it. Then again, if he’s secretly in love with you, he may ask you “what was his deal?” or something like that. It lets you know his deep care for you and how much he didn’t like that guy talking to you. If you catch a Cancer man staring at you from across the room, he likes you. That’s a given! He is a very shy man and so sometimes all he can do is stare in awe of your beauty. He’ll stand away afraid to approach you but cannot seem to keep his eyes off of you. Why don’t you offer to buy him a drink or have one sent to him? He’ll be floored and it will let him know you’re interested in him too. PreviousPrevious post:How To Seduce A Cancer Man: What Will Really Turn Him On? Next post:Ignoring A Cancer Man - Will He Come Back To You?